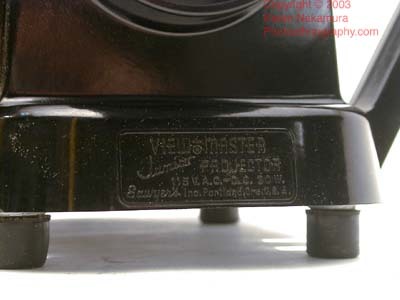 The projectors are made out of black Bakelite and grey powder coated metal. Both are in very good condition with no large scratches or dents. 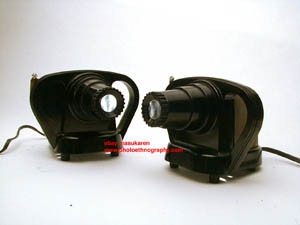 The lenses are clear and transmit light cleanly. I don't own any Viewmasters slides myself, so haven't tested them as to projection ability. You must understand that: 1) they are using 30 watt bulbs and 2) they are rather dinky plastic lenses, so don't get your hopes up too high and imagine that you can project 6' away an image that is 4' x 4'. I'd say this was designed for very intimate viewing. I'm not quite sure what to do with them as I'm not a ViewMaster fiend myself. If you're interested in them, please make an offer. I think $50 each sounds reasonable. I can sell them individually or separately. 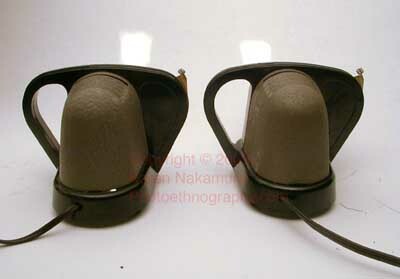 If you have two, you can put the same ViewMaster slide in both and go for the stereo projection look. Both of the projectors work, although I won't guarantee that the bulbs won't break during the shipping process. You should be able to get a replacement bulb easily, they are only 30watt bulbs. Copyright © 2003 by Karen Nakamura. All rights reserved. This page may not be reduplicated in any form. Last modified: Thursday, 10-Mar-2005 01:33:31 EST , [an error occurred while processing this directive] .